In my recent series of articles, I examined six different elements of a business model: customers, products and services, channels, profit, people, and infrastructure. A well-planned business model and a well-executed strategy to support it should allow you to achieve your business goals. To date, the series consists of the following installments. What’s the business model again? It’s how you make money. Your business model is always changing, reflecting the goals and strategies you choose to pursue. This week, I am addressing two other key aspects of running a successful ecommerce business: setting goals and developing strategies to support them. If you’ve done a good job of thinking through your business model and how the different elements need to work together, you probably have already developed many of your business strategies. Now it’s time to tie your strategies to measurable goals. You will then use the business model as the frame of reference to measure your risk and likelihood of success in achieving your goals. Business owners, consultants, and employees are generally confused about how to go about setting goals, strategies and tactics, or what they even really are. A great article on the definitions and where those concepts originated thousands of years ago is a 2009 posting on Brand Insight Blog. I’ll also spend some time clarifying things in the article. Goals. Should establish a measurable and realistic target to achieve. Set your goals before you decide on strategies. Examples might include: (a) Increase sales by 30 percent in 12 months; (b) Achieve a 15 percent market share by 2013; (c) Improve profits by 15 percent within two quarters. Goals can be at the business level or a lower operational level, but I am focused on the bigger picture supporting your overall business model now. So, if your business model is set up to be a high margin business, then your goals need to support that way of making money. To be real, a goal needs to be measurable and have a realistic chance to be successful. Strategies. An idea on how to achieve your business goals. Let’s say your goal is to increase sales by 30 percent in 12 months. An alternative strategy might include adding new products to grow top line revenues. Or, improve the overall conversion rate for all visitors to your website. Another might be to get your existing customers to buy more from you. It’s a good idea to have more than one strategy to support a goal. Just make sure you are able to execute all the strategies successfully. Tactics. Individual plans and actions to support the bigger strategic ideas. Tactics to support improving your overall conversion rate could be: (a) Redesigning your shopping cart to reduce abandonment; (b) Offering more incentives to buy now as shoppers are in your cart; (c) Improving the speed of your website; (d) Adding an alternative payment method to your checkout; and (e) Remarketing to those who abandon their shopping carts. In most cases, you will have many tactics that are employed to be successful in your strategy. 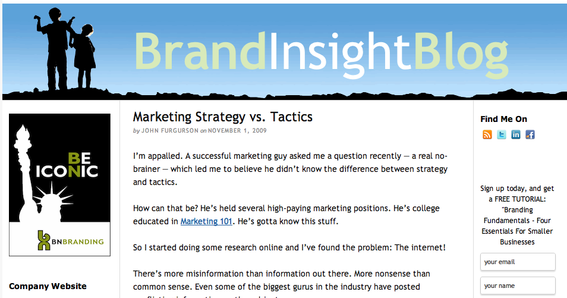 An article in Brand Insight Blog helps to understand the concepts of strategies and tactics. Why Bother to Set Goals? You may be wondering why even bother to set goals. I can’t imagine not setting business goals because those goals are what will drive your strategies and business execution. Whether you are a start-up struggling to develop your business model, an existing business struggling to stay alive, or a high growth company, goals establish your business framework. Let’s step out of the ecommerce world for a moment and think about how most people buy a new house. Imagine if you are looking for a new place to live. First, you think about what you are looking for in your new house or apartment. What size? Where is it located? Do you buy or rent? How many bedrooms? How big a payment can you afford? How much maintenance is required? What schools are nearby? Is it close to public transportation? Think of that as your housing model. Next, you need to decide what your goals are. Let’s say they are to buy a house within 20 miles of your office within the next 6 months. Your strategy is to get help finding the best house from a real estate broker rather than to look for yourself. Your tactics might include interviewing brokers, looking online for brokers who have listings in the area where you want to live, and to engage friends and family about a referral to a broker. You may also go to a bank and get pre-approved for a loan to smooth the process. Now imagine you have an ecommerce business that is plodding along, but you want to boost your profits. You have your business model in place with a single online store selling a product to a broad market. You do your own fulfillment and customer support and have a set of manufacturers that make your products for you. Start by setting a high-level business goal of improving your revenue by 15 percent within 12 months. You decide on a few strategies you will support that goal. First, you’ll look for a new line of widgets that appeal to kids. Second, you’ll expand your channels to find new customers. Finally, you’ll explore new branding opportunities for your existing widgets to create more demand for your products. Your tactics may include doing market research with kids to see what kind of products they like. Then, you may look for a way to target your existing products to kids. You may also build a custom product for kids. Finally, you may explore opening up a new website targeted at kids. To support new channels, you may explore marketplaces like Amazon and eBay stores. You may also decide to sell your products as a wholesaler into brick and mortar channels to reach customers who do not shop online. Finally, to expand your brand, you may engage in social media campaigns, establish a Facebook and Google+ brand page, and expand your advertising in magazines read by prospects. You may also hire a brand agency to create a more modern logo and messaging. As you go through this process, it’s the thinking that’s important. Make sure your business strategies support your business goals. Always make sure your business goals are achievable within the framework of the business model you have developed. If they don’t, but they are a priority, then you may need to rework some parts of your business model. If you pursue a singular strategy of improving sales by adding new products and you are doing all your own warehousing and fulfillment, develop tactics to support that. But you must make sure they fit within your business model. It is unrealistic to pursue a goal of 50 percent sales growth by tripling the number of products you carry in your stores if you have no more space in your warehouse to fit additional inventory and people to do fulfillment. But, you may be able to target Amazon for the revenue growth and let it do the fulfillment for you. Likewise, you may decide on a tactic to add online chat to reduce cart abandonment, but if you don’t outsource that or hire a new person, some other area of your business may break as your employees try to support the new chat activities. There is risk in every aspect of planning your business. To do any type of planning, you must make assumptions. Many people avoid planning and budgets because there are so many assumptions made. I view planning as a vision that you support with as many facts and as much knowledge as you can to identify and minimize your risks. Each assumption you make has risk associated with it. In my next article, I’ll discuss how to identify your risks and mitigate or reduce the risks associated with your assumptions about your business model and your strategies and tactics.